I mentioned the idea of a launch pad earlier in the series. This is a Flylady term for putting all of your stuff in a place that is easy to find and grab as you walk out the door first thing in the morning. The key to this is having a good landing place or pad when you come back in. I have had to decide where I want to put things down when I walk in so that I am not scrambling for stuff when I need it again. My keys have a home so that is where they go when I come in. There is a strategically placed key rack where keys live in our home. I own two keys and they are on one key chain. Dan owns about 50 billion and they also live on this rack. It is a small miracle that this rack is still hanging on the wall but it is. I have three places (besides the ignition of the car or the front door) where my keys are at any given time. The first place is the key rack where they live overnight. The second is hooked onto my purse. They are attached to a carabiner and it hooks conveniently onto stuff. The third place is hooked to the belt loop of my pants. If I follow this system and never just lay my keys down randomly then I do not scramble to find them... EVER. It is a lovely habit and my sanity is intact when it comes to keys. Do you have a system for keeping up with keys? I also have a landing place for my purse, books and other things I take with me when I leave the house. I take an electric blanket with me to work (because it is always 62 degrees in the house I work in twice a week.... for medical reasons for my client). I keep that in a bag just by the front door so I can grab and go and when I come in with it I park it there immediately. The kids have not been as successful with this system because they tend to drop stuff randomly but they are working on it with my nagging.... oh, I mean help. Ha! I am not responsible for my husband's landing places. I would not dare. We do not think alike all the time so I don't impose my system on him. I also have a book in the bag that goes with me... all the time. Once I finish a book it gets shelved or put in the giveaway box by the front door and then I replace it with the next book in line. All of this brings delightful sanity to my days. When I have to rummage for something or it is not in it's home that throws me for a loop. If a child moves something of mine we are in trouble. LOL It slows us down and makes my brain crazy. With Lupus less crazy is better. 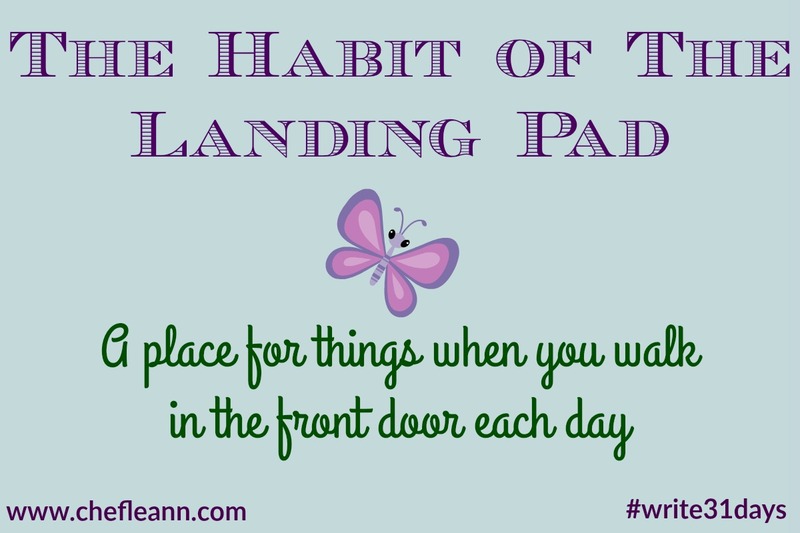 Do you have a landing pad for things when you walk in the front door? If you don't I recommend deciding on that place today and then start using it immediately! It really is a small habit that can rock your world for the better. 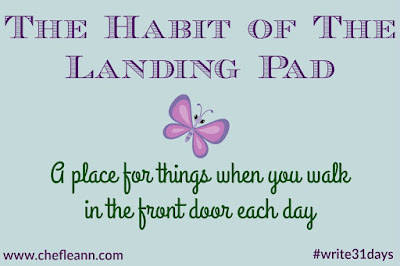 What kinds of things can live on a landing pad? Find what works best for you and your family. Do you have a favorite tip for this topic? Do you have a favorite website where you get great ideas for such things? Share your system with us!